Community Board 6 held its first meeting since the Atlantic Yards/Gowanus Massacre by Brooklyn Borough President Marty Markowitz and City Council Member David Yassky that ended the service of nine longstanding members. The Board voted down a resolution criticizing the dismissals and suggesting that the "independence and, indeed, the fundamental value of Community Boards are undermined" by removal of members based on their position on controversial issues. The Board voted against the measure by a voted of 14-6 with a large number of abstentions. "There was no litmus test and I was not asked to rubber stamp anything," one of the new Markowitz appointees said. Nearly an hour of last night's meeting in Park Slope was taken up by introductions and an explanation of the workings of the body for the new members, several of whom arrived more than a half-hour after the 6:30 meeting start time. CB6 Chair Richard Bashner thanked the deposed board members "for their many, many years--and in some cases decades--of service." Mr. Bashner named most of the members that were removed by Mr. Markowitz to non-member positions on CB6 committees. "As an advisory group were are strongest when we work together," Mr. Bashner said, although he added that "very strong advocacy...is perfectly fine." CB6 was noted for the opposition of many members to Atlantic Yards last year, a factor that played into the dismissals. The upcoming rezoning of Gowanus, in which CB6 will have an important role, was believed to be another element in the decision. There is significant debate over the density of development in the neighborhood and the Borough President supports zoning at the higher end of the scale. "I'm honored to be accepted as a new member," said Brad Lander, the former director of the Fifth Avenue Committee and Director of the Pratt Center for Community Development who was appointed by Council Member Bill de Blasio. 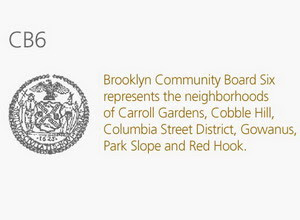 Mr. Lander, who is well-respected in the community, has been named the chair of CB6's Housing Committee. The dismissals reverberated at the end of the meeting, when a community member presented the board with a symbolic rubber stamp. "What the Borough President did was disgusting and insulting to the community board, but you guys showed courage," he said. yeah... real courageous for community board members to vote against a project. that is basically all community boards do in new york city -- prevent change from happening regardless of whether it's good or bad, progress or destruction. massacre the whole lot of them. Did you even read what CB6 wrote about the project? They made constructive criticism and said they couldn't support it as currently designed. They didn't say kill it! But I guess reading it wouldn't fit in with your idiotic strategy. Or was it simply the reading that put you off? Good for CB6 defending Brooklyn from greedy developers and their cowardly and stupid Anonymous supporters.